Clean, uncomplicated and full of flavour, healthy foods are without a doubt the way forward. So whether you’re looking to hop on the healthy eating bandwagon or you want to reap the benefits of healthy snacking, here at uOpen we have the 5 best healthy food subscription boxes to excite your taste buds all year round. 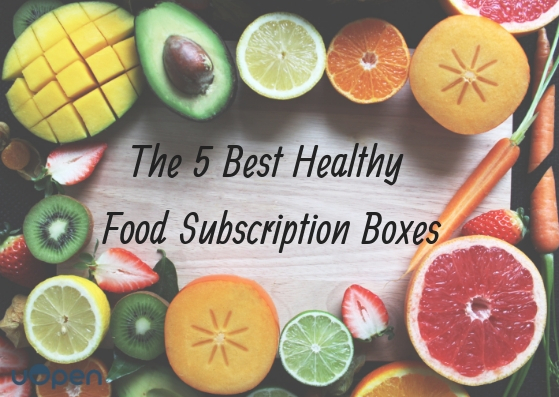 Become a healthier and happier you today with a healthy food subscription box from uOpen! The best way to adopt healthy eating habits is to start with all the right ingredients. All Things Baked brings you their fabulous vegan subscription box - full of mouthwatering vegan recipes and top quality organic ingredients to rock your taste buds every month. Making healthier food choices doesn’t necessarily mean you have to compromise on taste or give up on delectable puddings forever. With The Vegan Box from All Things Baked, you can enjoy all the desserts you love - guilt-free! Plus, you’ll get the added bonus of whipping them up from scratch in the comfort of your own kitchen - so you know exactly what types of ingredients are going into each and every baked treat. Each month, you’ll receive a new recipe and the required ingredients to create enough tasty bakes for a minimum of four people! Do you enjoy a little afternoon snack pick-me-up? Why not make the most out of your light meals with Lifebox Classic? Your health and wellness journey awaits with the ultimate healthy snacks subscription box. Fill your body with all the right energy and nutrition it deserves with a delicious and lovingly curated variety of 12 handpicked snacks, drinks and ingredients every month. Do wonders for your mind, body and soul with a delicious bundle of healthy vegan, gluten-free snacks and wellness products. Plus, enjoy a wonderful 12-page booklet containing recipes and information about the products in your box. Your quest for health, happiness and wellness starts here! Protein powders, energy bars, superfoods and awesome workout equipment - Wellthos Health and Fitness Box is bursting with healthy and energising snacks and products. Whether you’re looking to fuel your workouts or boost your overall energy, the Wellthos Health and Fitness Box delivers you an exciting mix of 10 items ranging from the latest and emerging health foods to fitness accessories. Wellthos is your ultimate monthly companion if you’re looking to make a healthy lifestyle change. Plus, receive an exclusive magazine in each monthly delivery that is full of deliciously healthy recipes from guest dietitians and nutritionists, as well as fitness advice from personal training partners. Do you have a passion for cycling? Training for your next running marathon? If you love to lead an active lifestyle then the Vivi Nutrition Box is the perfect monthly companion for you! Maximise each and every workout with the ultimate monthly assortment of 12 nutritional products and healthy snacks. From energy bars and hydration sachets to recovery and protein powders, you’ll be fully equipped with all that you need to make the very most out of every workout. Enjoy the most delicious and nutritional mix of snacks every month to help you power your performance - whether you’re a cyclist, runner, swimmer or hiker! Good health begins in your belly - which is why SourcedBox brings you the most healthy, tasty and innovative selection of treats every month. It’s time to trade in those super sugary snacks for a tasteful punch of guilt-free deliciousness from the SourcedBox. Discover exciting new flavours and different brands every month with a box full of 10 tasty treats. Enjoy goodies that are bursting with natural ingredients and are free from refined sugars - give your body the nourishment it deserves today! Kickstart your healthy living with the perfect dose of nutritious and delicious treats to munch on all month long. Looking to make a healthy lifestyle change, but not sure where to start? Here at uOpen, we have an exciting selection of health and fitness subscription boxes to keep you inspired and making the healthy choices all year round!